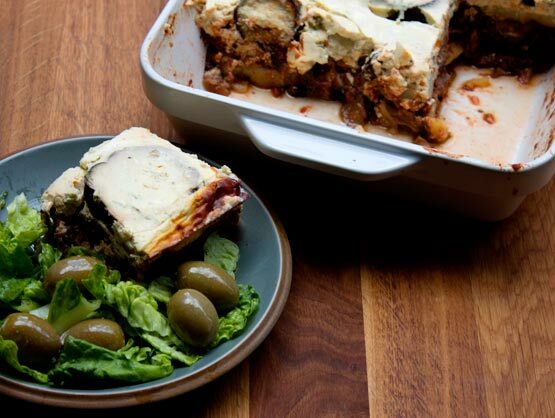 This vegetarian moussaka is from the Cornucopia Cookbook – just minus the lentils and with a slight change to the spices used. I love it. Hope you do too. This recipe I originally posted on abitmoreveg is an adaptation of a recipe from Cornucopia’s cookbook, which is excellent. I changed it a bit because at the time I was reading a whole load of articles about healing your gut and I was very enthusiastic about the whole thing – so in the beginning you give up all grains and legumes and whole bunch of other stuff which is why I didn’t add in the lentils to this and why I adjusted the amounts of different spices etc to compensate. I didn’t stick with the healing-the-gut thing because it was too difficult (did you know garden peas are actually legumes? they are) and when I did eat legumes again I didn’t notice any ill-effects, whereas if I add back in gluten to things I do, so… Anyway this is a great recipe from a great cookbook. A slice of gluten-free vegetarian mushroom moussaka with a side of crisp lettuce leaves and big green olives with a little dressing. This a very satisfying and nutritious dish. The white sauce used to top the moussaka is gluten-free, made with a mixture of yoghurt and eggs with some mint, nutmeg and seasoning. This means it’s much more nutritious, packed with more protein and minerals, than the normal white sauce made with whole milk, butter and flour. Not that I don’t love the normal white sauce but it’s nice to know that this gluten-free substitute is just as natural and even more nutritious. This recipe is from Cornucopia’s recipe book – just minus the lentils and with a little garam masala added in. I got this recipe from the Cornucopia at home cookbook. Their recipe uses lentils but I’m avoiding legumes for a little while, if you’re not then I’d strongly recommend adding them in as they are a great source of protein and fibre. As it is here though this dish still has a good amount of protein from the eggs and dairy. And the taste is great; I love it. So I’ve mentioned a couple of times now the health benefits of tomatoes and mushrooms. I think this is first recipe here where I’ve used aubergines so I’m just going to point out what’s good about this fruit – yes, apparently it’s a fruit. Aubergines are low in calories but high in fibre and they have high levels of anti-oxidants, namely they are rich in chlorogenic acid and nasunin. You can find out more about those here. Mushrooms, tomatoes, aubergines sprinkled with garam masala, potatoes, onion, garlic, cumin, cinnamon, oregano, bay leaves, salt and pepper. Greek-style natural yoghurt, eggs, nutmeg, fresh mint, salt and pepper, – ingredients for the gluten-free white sauce. Put the potato slices in a pan of water and bring to the boil. Boil for 10 minutes or until they have just started to become tender – you should be able to push a fork through a slice but the slice shouldn’t be so soft that it crumbles as you do so. Drain off the water, sprinkle a little salt over the potato and leave aside for later use. Put the aubergine slices in bowl pour over a couple of tablespoons of olive oil and mix around, then sprinkle over a little garam masala so that each slice has a little dusting of the spice mix. Put in a baking tin or tins (the more space between slices the more quickly they cook) and bake in the oven for about 20 minutes, turning the slices over halfway through. When done, take out and leave aside for later use. Reduce the oven temperature to 180 C.
Heat a little olive oil in a deep frying pan. Add the onions and fry on high for a couple of minutes. Keep stirring to avoid burning. Add the mushrooms, garlic, oregano, salt and pepper. Stir around well. Keep stirring to avoid burning. You want to cook the mushrooms well to dry them out a little. This will take about 10 minutes, or longer if you have sliced them thickly. Add the tomatoes, cumin, cinnamon and bay leaves. Break up the tomatoes well so that there are no large lumps of tomato. I use a potato masher to do this but if you are using a non-stick pan be careful doing this as you can easily scrape the pan. Bring to boil and let boil until the tomato sauce has thickened. It should only take a couple of minutes. Reduce heat and leave to simmer for 10-15 minutes. When it’s done remove the bay leaves. Taste and adjust seasoning if necessary. Oil a large baking/pie dish with some olive oil. Pour in half of the tomato-mushroom sauce, layer with potato and then with some aubergine slices, then pour over the rest of the tomato-mushroom sauce and layer this again with the potato and then aubergine slices. Crack 3 eggs into a large bowl, add the nutmeg, salt and pepper, and whisk. Stir in the yoghurt and mint. Pour the white sauce over the top layer of aubergines. Place in the middle of the oven and bake for 30 minutes or until the top has set and is turning brown. Slice the potatoes thinly, about 1/2 cm thick. Sprinkle garam masala over the aubergine slices, toss in a little olive oil and bake in a hot oven for 20 minutes or until turning golden brown on both sides. Mushrooms contain a lot of water so I find it best to make sure they are well cooked before adding the tomatoes. Add the tomatoes, bring to the boil. Let the sauce thicken, reduce the heat and simmer for 12 – 15 minutes. Grease a baking dish with some olive oil. Pour in half the tomato-mushroom sauce, add a layer of potato slices, then a layer of aubergine slices, and repeat. You’re supposed to beat the eggs before stirring in the yoghurt. If you beat them all together, as I did the first time I made it, you get a more liquid sauce which scrambles a little bit (which is what happened to the topping in the meaty gluten-free lasagne) – but to be honest it’s still really good. So don’t worry if you do this. Serve it with tasty, large green olives to give it a good-fat boost – and to make it an even yummier lunch. So filling and so full of flavour – vegetarian deliciousness.